I wouldn't be surprised with this. I also believe that we have the most number of types of mangoes in the world. 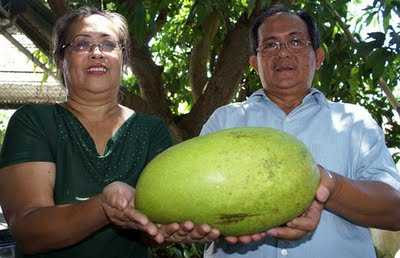 The Guinness Book of World Records has certified a 3.5-kilo mango from southern Philippines to be the world's biggest. Radio dzBB reported early Monday that the mango, which surpassed the 2.4-kilo mango from Canada, was a product of Sergio at Maria Socorro Bodiongan of Iligan City. It was submitted to the Guinness Book of World Records last September. It was also the highlight of the Sundayag activity led by the Department of Agriculture (DA) Region 10 in Cagayan de Oro last year. 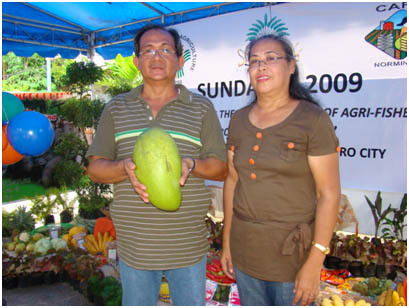 Sergio Bodiongan, with wife Maria Socorro, holds the world's biggest mango during DA's Sundayag Festival in Cagayan de Oro City last year. The DA in Region 10 also rejoiced over the recognition of the mango. Suzie Roa of DA Region 10 said it was a feat for local agriculture.